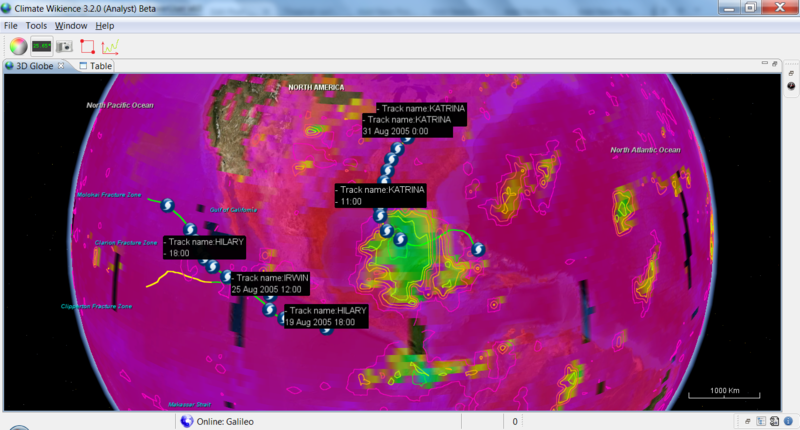 Tropical Cyclone Tracks are obtained from IBTrACS – International Best Track Archive for Climate Stewardship. The dataset covers period 01 Jan 1848—current. Hurricane/Typhoon John in northeast and northwest Pacific Basin is the longest lasting tropical cyclone: 31 days, August 11 – September 10, 1994. 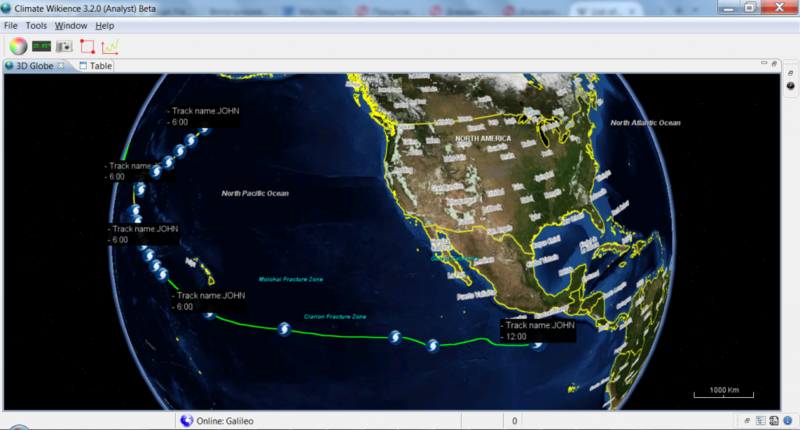 It is also the tropical cyclone that traveled the longest distance: 13,280 km (7,165 mi). You can navigate in time by simply double-clicking cyclone centers. 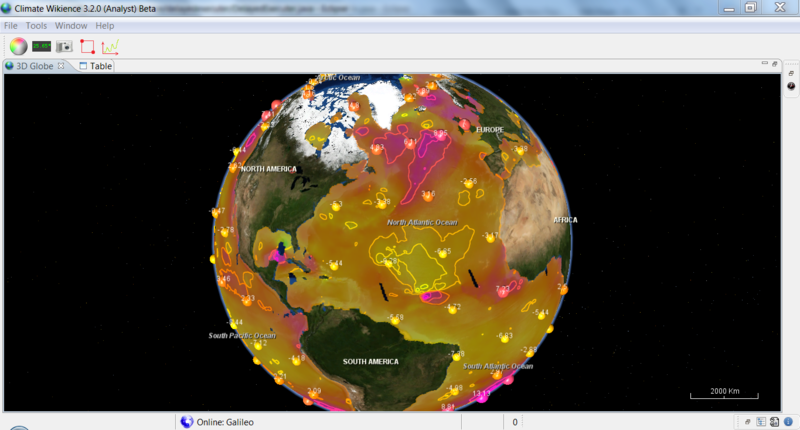 Climate Wikience will change the current time to the time of the center you have clicked on. This will trigger refreshing all other layers: the data will be automatically downloaded for the new date and layers will be redrawn (isolines recalculated and redrawn along with new surfaces and markers). 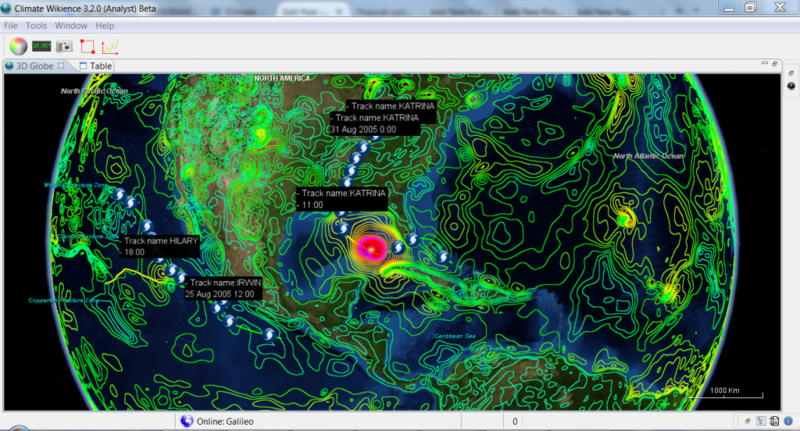 In addition to IBTrACS, Climate Wikience provides over 700 variables that can be used to study tropical cyclones. Examples include wind speed and cloud properties. Hurricane Katrina track and CFSR wind speed at 10 meters above surface, 28 of August, 2005 (the date near the hurricane peak strength). Hurricane Katrina track and cloud top temperature (Terra MODIS satellite data), 28 of August, 2005 (the date near the hurricane peak strength). Wind speed at 10 meters above surface derived from satellite measurements including QuickSCAT, SSMIs, TMI and AMSR-E, 28 of August, 2005 (the date near the hurricane peak strength).